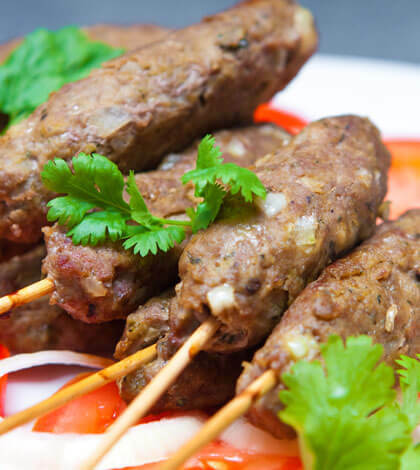 Who can say no to the authentic and royal taste of kebabs? The tempting sight of those delicious and colourful seekh kebab rolls can make anybody ask for more without thinking of their calorie counts. If you have already been through the situation, don’t worry our exclusive vegetable seekh kebab recipe will help you to stay guilt free even after hogging on them. Surprisingly, it also helps in weight loss as we encourage only nutritive ingredients. Heat a non-stick kadai. Add ginger garlic paste and sauté for ½ a minute. Add mashed potato, carrot, green peas & french beans & roast till it gives a nice aroma. Add amchur, chaat masala, green chillies, roasted chana powder and continue to cook for 2-3 minutes. Add cottage cheese and mix well. Add salt and mix again. Divide into 8 equal portions. Take each portion and spread around a skewer in a cylindrical shape. Heat a non-stick pan and toss the skewers on it. Cook on a medium heat, rotating the skewers from time to time so that the seekh kebabs gets cooked evenly on all the sides, to golden brown. Serve hot with tangy chutney! Recommended Read: Did you know ‘Anti Inflammatory Detox’ helps greatly in weight loss?